There's a punch line from an old joke about golf that you don't have to be good at it to enjoy it. Well, as I'm starting to build my weathering skills, I find that I'm really enjoying the process - even if my efforts don't turn out quite as I'd hoped. And I'm discovering that weathering - like so much in the hobby - can't be learned from research, reading books, or watching videos. Those are all great ways to start and they do help - a little. But to really learn how to do it, you have to do it. And you're gonna mess up. It's not a matter of whether but when & the sooner you accept that - if not outright embrace it - the happier you'll be. And the quicker you'll develop some skill. I figured I'd use a light wash of India Ink & alcohol to show a house by the tracks of a steam-era railroad. Well, as you can see, it didn't come out "light" at all. Yeah, I was a bit upset at first, thinking I'd ruined things. But - as I'm discovering - there's little that you can do with weathering that'll truly ruin anything. You just have to keep going over it. So I got out my paint and brushes and started brushing color back on to lighten things back up. And, as you can see, the effect is actually pretty convincing - looks like some faded, sooty, weathered walls there. At least to my eye . . .
As before, I just took some more white paint and used a dry-brushing technique to lighten up the windows that were too dark. You learn a valuable lesson - and gain a lot of confidence - when you realize that you can correct the inevitable mistakes you're gonna make. The chimney was just brush-painted a red brick color (using craft paint). Note this small detail taped to cardboard for easier painting. Then I went over it with a white wash to get some mortar lines. I'm not very happy with how it came out - seems that the mortar grooves in the plastic aren't deep enough to allow you to wipe away the brick faces without removing the paint from the grooves as well. But I'll see how it looks on the roof. Maybe the unevenness will look effective then. And the hits kept comin'! - or, in this case, the mistakes kept being made. This was my attempt to use "a little" black powder to represent some "light" runoff from the window frames. UGH! Definitely used too much - and then made things a bit worse by trying to rub it off. Ah well, a combination of rubbing and adding more wall color started to tone things down, but still not looking quite like I'd hoped. And at that point, I decided that would be enough for this session. "A man's gotta know his limitations" - at least when it comes to plowing through weathering. Sometimes, when plowing, it's best to take a break, pull back a bit, and make another run at it. Doesn't mean you quit - and especially doesn't mean you never start - but when developing a new skill, taking a break gives your brain a chance to absorb - and really internalize - what you've learned. Despite some of the frustrations though, my efforts here were just what I said at the beginning - VERY fun! Of course, it helped that nothing melted :^) nothing got ruined, and I was able to correct the many mistakes I made. But I'm learning a lot. And, most importantly, weathering really starts bringing the model to life! If you haven't tried weathering, I hope you will. Like golf - among other things - you don't have to be good at it to enjoy it. Hmmmm.... maybe not the kind of booty you were thinking. But if you move your mind from that to talking like a pirate, then you'll get my drift. Yes, it's my annual review of what Santa brought me for Christmas: Railroad-wise . . . Here are some pics from my Christmas layout to put you in the holiday mood. Hope you enjoy them and hope, even more, that you and yours have a Wonderful and Very Merry Christmas! Sometimes, to get to a particular destination - whether a beautiful waterfall or mountain top view - the journey is part of the fun. And sometimes it's just something to get through to get the reward. Those journeys often take longer and the going is rough - there may not even be a trail, and you have to go hacking your way through the brush and overgrowth just to make some forward progress. So it is with grooving new synapses when you're learning a new skill. You have to go over the same path over and over again and the going is pretty slow. 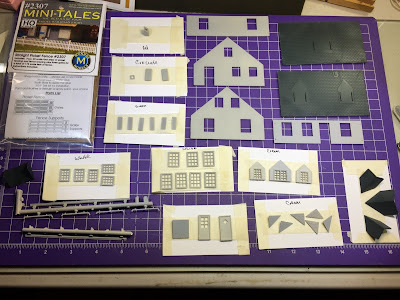 I wanted to get my latest structure build all nicely painted, but I don't paint - nevermind airbrush - nearly often enough, so each time I do it, it's like I'm having to learn it all over again. So out comes the machete and off I go, hoping I have a large enough block of time to at least get to a good stopping point along the way. Today's journey took about 5 hours, from set-up to clean-up. I can only hope that as I do more painting more often that I'll get faster at it. Here's what I did. . . The house is going to be basically 5 colors. Fortunately, two of those colors ("concrete" for the foundation & steps and Hunter Green for the shutters) were available in rattle cans. The other three colors I used were craft paints I mixed for airbrushing (click here for how I do that). Note sharpie marks on the side to get the paint/medium ratio correct. I'm painting the walls an ivory color, the windows and trim will be white, and the roof will be a dark grey. I mixed 1/2 oz of each craft paint with 1/2 oz of airbrush medium and 1 ml of flow aid to make a 1 ounce bottle of each color. And (thanks to Roman) I used a fancy labeler to keep track of them all. All that figuring and mixing took a fair amount of time, and then the airbrushing took even longer. In the spirit of full disclosure . . . although I like the price and availability of craft paints, and Greg LaRocca's article showed me how I can shoot them through my airbrush, I'm still learning how best to do it. "Your Mileage May Vary", as they say. I, for one, discovered that I really needed to apply multiple (at least two) coats of each color to get full coverage. The first coat just came out really blotchy - especially on the roof sections which I hadn't primed. I don't know if I added too much airbrush medium or flow aid - I didn't even add any thinner! - but it seems that the paint could actually stand to be a bit thicker. That said, the roof sections actually ended up coming out the best (and that craft paint was by far the thickest of the lot, but I used the same mixing ratios), and the ivory colored paint I used on the wall sections, which seemed to be the thinnest, kept clogging up the airbrush and still needed multiple coats. I kept a Q-tip dipped in airbrush cleaner on-hand to keep the nozzle clean, but I still needed to run a lot of cleaner through the brush from time to time to keep things going. All that took quite a bit of time. Fortunately, the concrete and green colors were applied with literally just a few shots from each can, held a long way away from the parts (18" or so) to keep the paint from building up. By the way, you may want to try what I did - taping the parts to cards and cardboard for ease of handling while painting. That certainly made it easier to move things around for the best coverage. Speaking of coverage, I was still not really happy with how the walls came out. 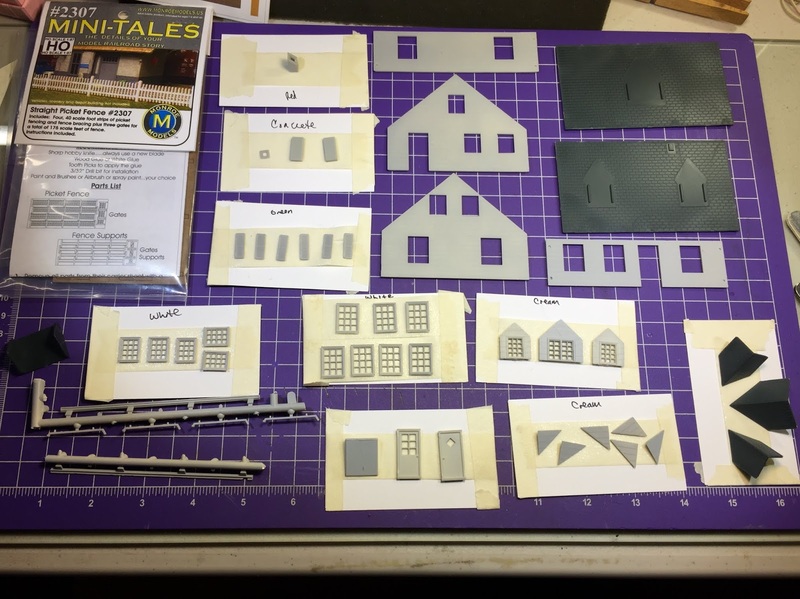 Since the dormer windows are molded into their walls (unlike all the other windows, which were separate parts), I knew I had to at least brush paint those. So I figured, while I was at it, I'd go ahead and brush paint the walls with another coat of the ivory (straight from the bottle, not thinned with anything). This photo shows how mounting the parts to cardboard makes painting a lot easier. One thing I forgot to take a picture of were the trellises and pergola. Actually, it was those details that first prompted the whole airbrushing option rather than just brush painting everything. I figured a rattle can of white would obscure too much of the "lattice-y" detail, and I certainly didn't want to have to brush paint all those little mullions and thin wood parts. Having said that BEWARE: even airbrushing acrylic/water-based paint on those wood parts risked causing the glue joints to fail. So certainly don't saturate them. Now that everything is painted and drying - and I'm not looking at it all from a couple inches away - I'm really happy with how it's all looking. And one of the best things about using acrylic paints is how fast they dry (not to mention the lack of toxic fumes) - so I should be able to start assembling the house tomorrow! All in all, not a bad way to spend a long afternoon. Sure, everything took a lot longer than I anticipated, but I had the time, I'm blessed with a comfortable work space, and I (almost) got all caught up with my favorite podcast in the process. So even a tough journey was made a lot more pleasant. And a nicely-finished structure for the layout will certainly make the trip worthwhile. I don't have a great track record when it comes to getting started on projects - especially when it comes to modeling. 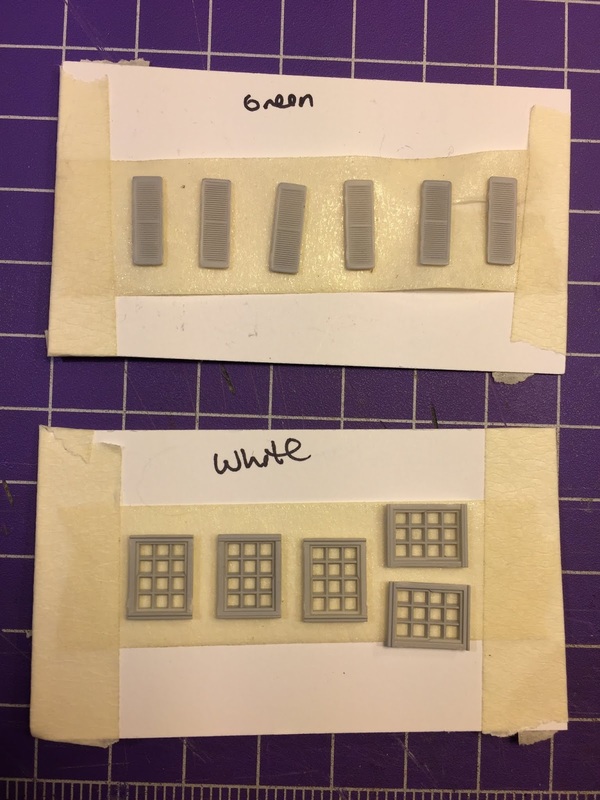 Witness the 3 years it took for me to get around to using the resin casting kit I got one Christmas (and I'm not even going to mention - again - the quarter-century it took me to (re)start airbrushing...). Let's just say that my reach all-too-often exceeds my grasp. 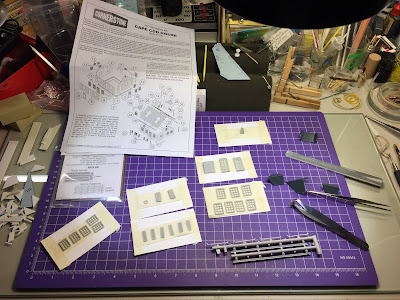 It's one thing to get a model kit - it's a far different thing to start, and finish, it. So the fact that I've started building a kit less than a year after I got it is a minor Christmas Miracle. Yes, last Christmas, the Missus - inspired by this painting of "My Dream Cottage" on my 1948 calendar . . .
Got me a "Dream Cottage Kit" that she made up herself . . . The "kit" was/is actually made up of 3 kits, plus details - including the house itself (Walthers 933-3776), a picket fence, a pergola & trellises, hydrangeas and roses. Well, going against my usual bent, I actually built the pergola & trellises already (only 11 months later! click here for the build), and now I'm starting on the house itself. With a little luck, it may even get done before another Christmas rolls by . . . I used warm water with Dawn grease-cutting soap & a toothbrush . . .
then set the parts aside to dry thoroughly. Once dry, I primed all the parts (except the roof) with a rattle can of Tamiya Fine Surface Primer (gray). I didn't bother priming the roof since the plan had been to add Campbell's shingles to the roof. But I decided later to see how nice I could make the stock roof look with paint & some weathering. And, just in case I forget what color I'm supposed to be using, I write it right on the card. The next step will be to mix up the different colors of craft paint for airbrushing. In the past, I was always too impatient to do anything other than jump right in and assemble everything right away, figuring I'd paint it later. But I think taking the time to clean up the parts nicely, and painting everything beforehand will look much nicer - especially if I want a nice contrast between white window frames, cream walls, and green shutters. Be sure to stay tuned to see how it turns out - and, as always, if you have any tips/suggestions please let me know. 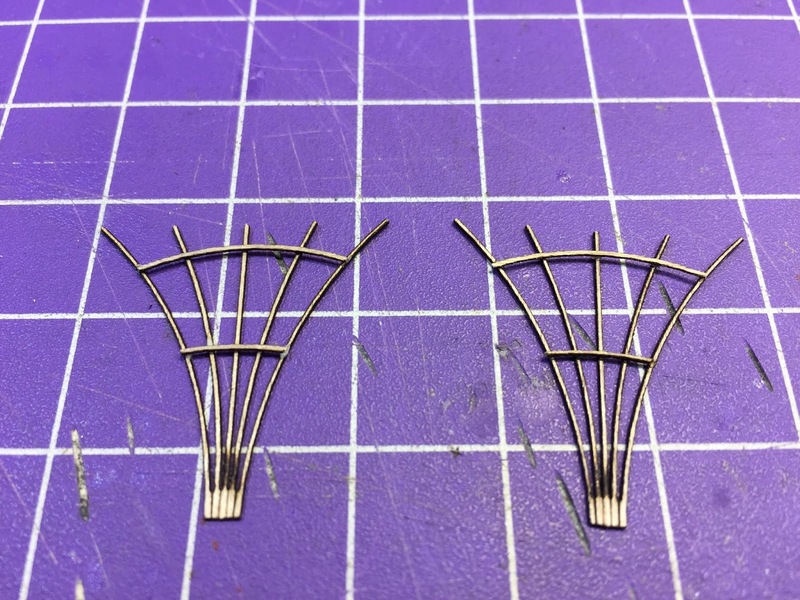 Despite how long I've been into model railroading, I'm still a rank amateur when it comes to structure building and really appreciate the benefit of others' experience. Meanwhile, there are some "folks" who don't fret over such things. They're content to while away their time and toast themselves in front of the old railroad stove . . . Yes, I just placed that old hassock cover there to see if Lexy would use it. Like a moth to the flame . . .
Start by carefully removing the parts from the sheet. I started with an X-Acto, then a scalpel, but the most effective tool ended up being the simplest/most common tool of all: a single-edged razor blade. Here are all the pergola parts laid out. You build it up in layers - each side has three layers. While I considered using ACC to glue things together, I ended up using regular wood glue, applied with a micro brush. While the kit is really straightforward and easy to build, taking your time and paying attention will yield the best results. Here, I'm using a straightedge to ensure that the tops of the three layers of parts are perfectly flush with one another. - and that the notches line up perfectly. The white is a stack of business cards shimming the long leg of the square to keep the short leg perfectly level. The instructions tell you to turn the pergola upside down to attach it to the slats (rafters) (which are conveniently - and ingeniously - spaced perfectly on the sheet). The only caution in building this kit (and not mentioned in the instructions), is to be sure to remove the part of the sheet from each end of the rafters - as you see in the pic above. If you don't, you won't be able to get the beams snug against the slats. And here are close-up finish photos! After finishing the pergola, the trellises were pretty easy - though a bit more delicate. So be sure to take your time and use a steady hand. 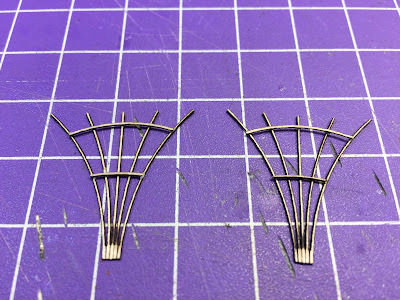 All that's required is that you remove the parts very carefully and then glue the curved cross pieces (two per trellis) to the main/vertical parts using the printed marks as a guide for proper placement. And here they are finished! I'm planning on airbrushing the pergola and trellises white. But what should I do with the pergola base? I'm considering a brick color for the brick pattern and just brown or green for the rest of the base, figuring I'll add static grass or fine ground foam there. How would you recommend finishing these? I'm especially worried about obscuring the cool brick pattern. If you need a little modeling motivation, I hope you'll try one of these little laser kits. It was a really enjoyable way to spend a some quality time at the bench and now I can't wait to do some more modeling!